A trio of commercial divers have won access to £5,000 funding from Virgin Startup, to test the viability of creating an artificial reef off Torbay, Devon. The first project is located in Dorset and was conceived in 1997 by Tina Thomas of Portland Oceaneering. She put marked effort into the possibility of the Weymouth and Portland area having its very own 'Wreck To Reef'. Currently many Portland based businesses are supporting this non-profit community group. After significant investment and work 'Wreck To Reef' now has licences from the Crown to source and to sink two Destroyers and create an artificial reef from Reef Balls near Weymouth. It now needs to raise funding to make this plan a reality. 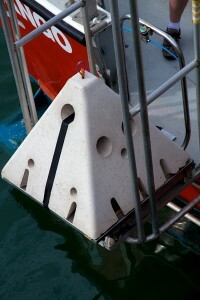 In the last few days a separate project has been announced to sink 10 'test' Reef Balls in Lyme Bay, near Babbacombe. The long term intention is that the Torbay Project will successfully get permission from the MMO (Marine Management Organisation) to grow the artificial reef to 1,000 Reef Balls within the Marine Conservation Zone. The team will then put in a bid for a further £45,000 loan to enable this to happen. Each project has two three positive outcomes. It will create new jobs in the area. It will have a positive impact on the environment by enriching the underwater world, boosting wildlife and replenishing damaged seabeds. It will help attract divers and improve tourism numbers by creating safe, attractive diving environments. Following the sinking of HMS Scylla off Plymouth, the City stated the local economy had benefited from an additional £5 million annual spent from visiting divers. Creating and sinking Reef Balls is not a new concept. Reef Balls are used the world over to mimic a natural reef system. A Reef Ball is constructed from concrete in such a way - a honeycomb of hollow shapes - it will create a habitat for fish and other marine life. A good example of this is HMS Scylla - she was rapidly colonised by Jewel Anemones.